Rheinberger's Abendlied (Evening Song) has been arranged for cello sextet by Valter Dešpalj, professor of cello at music academies in Zagreb and Liechtenstein. A graduate from the Juilliard School, Mr. Dešpalj studied cello under Leonard Rose and chamber music with Felix Galimir and the Juilliard Quartet. Mr. Dešpalj has performed all over the world, held guest professorship at conservatories throughout Europe, and been an editor of cello music with major music publishers. "Abendlied is the best-known composition by Liechtenstein born Josef Gabriel Rheinberger (1839-1901) who was an organist and a very prolific composer. This song, which takes its text from The Gospel according to St. Luke 24:29, has gained popularity with choirs world over. A good cello choir should certainly also be able to do justice to this beautiful music." 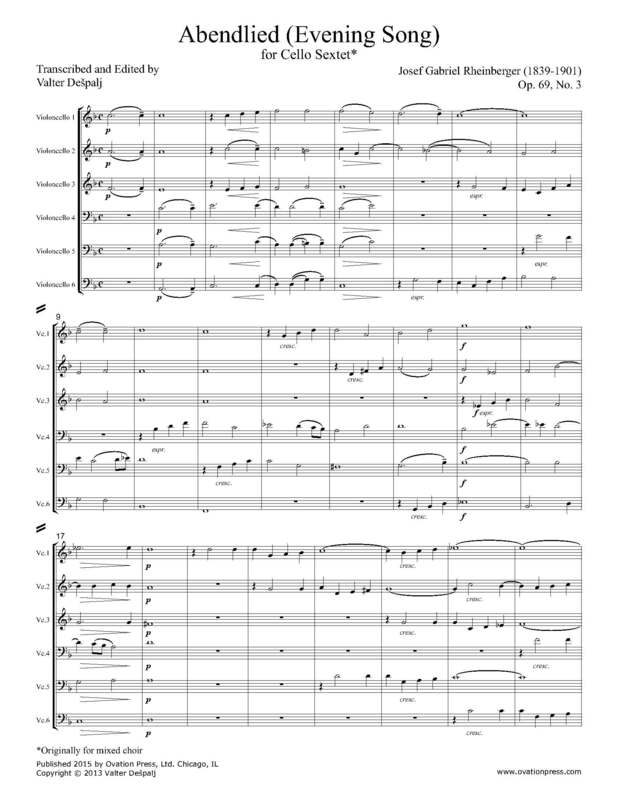 Download and print the score today to gain access to this expertly edited arrangement of Rheinberger's Abendlied (Evening Song) for cello sextet by Valter Dešpalj! Check out the video below to listen to a performance of this arrangement of Rheinberger's Abendlied by the Cello Ensemble of the International Music Academy in the Principality of Liechtenstein, directed by Valter Dešpalj himself!